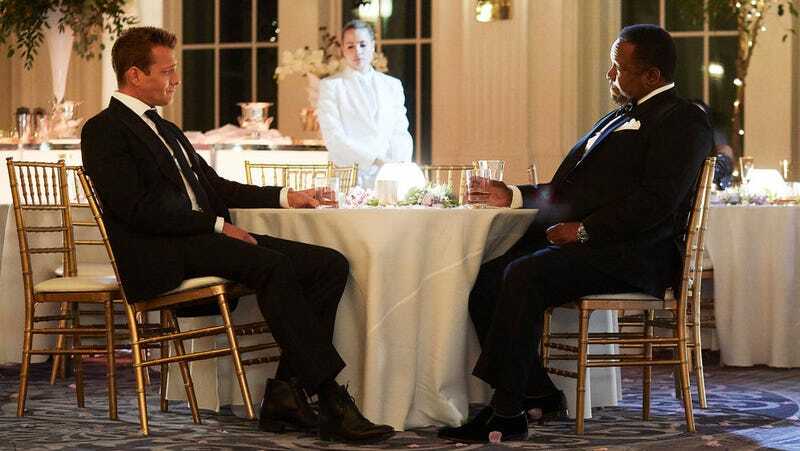 Gabriel Macht and Wendell Pierce in suits, on Suits. Here’s what’s happening in the world of television for Wednesday, July 18. All times are Eastern. Suits (USA, 9 p.m.): Mike Ross and Rachel Zane might be gone (you may have heard that actor Meghan Markle has had a slight change in lifestyle? ), but Harvey Specter’s firm carries on—or does it? In the eighth-season premiere, the firm is dealing with the fallout from the merger with Robert Zane, and nobody’s job is safe, not even Harvey’s. Katherine Heigl joins the cast, and Dulé Hill is upped to a series regular, so don’t expect the drama to slacken. We’re pretty sure “maximum drama” is written into Heigl’s contracts. The 2018 Espys (ABC, 8 p.m.): The Academy Awards of sports is back for another round of everyone watching and wondering, “Wait, don’t the best athletes already win awards? You know, for being the best? It’s literally a competition.” Regardless, here’s a chance to see famous people mingling with sports stars, as well as find out which event won the “best game” category, which should probably go to that group of randos who absolutely annihilated our crew in Destiny 2 this past month.